KTN’s talented sultry news anchor Betty Kyalo happens to be one of the hottest news anchors in Kenya and her beauty is always irresistible. A couple of weeks ago, the gorgeous screen siren walked down the aisle with the love of her life, NTV’s investigative journalist Dennis Okari in a glamorous wedding. The two lovebirds have been hitting news headlines everywhere and they have been sharing their photos while enjoying themselves in their honeymoon. At the moment, the media power couple is at the worlds’ most powerful city, Dubai and the two visited the desert safari to have a good time. Betty Kyalo posted a ‘tricky’ photo on her social media page that has left Team Mafisi drooling. Despite the ‘creative art’ in the photo, many men decided to concentrate on her thighs. 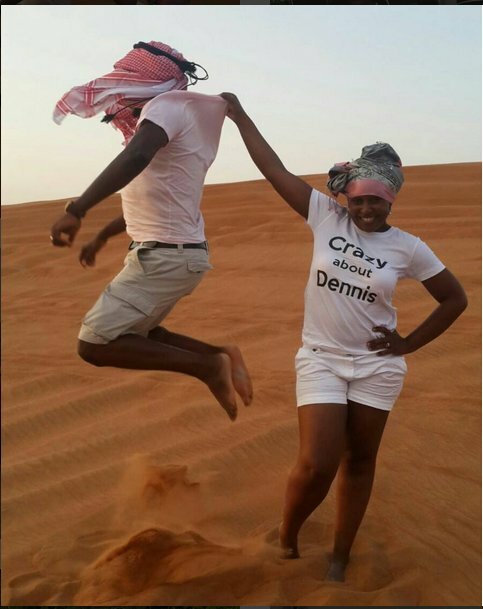 Below is a picture of Betty Kyalo Okari and Dennis Okari during their honey moon in Dubai, feel free to see what you like and like what you see. Yesterday after the desert safari which was mad fun!!!!! Adrenaline rush was at 200%. @ATouchSafaris 👌as always!